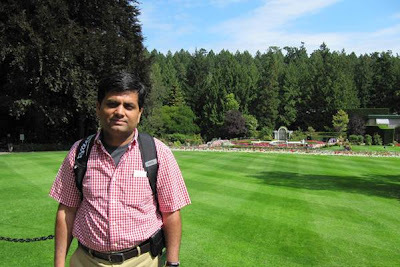 Our next contributor is Manoj S, based in Vancouver, Canada. Manoj is responsible for creating and expanding Westport business in South Asia, particularly in India. His market creation and market development activities cover new technologies or new initiatives across all Westport business units, targeting potential opportunities in markets from automotive through to high-horsepower. Fuelled with coffee and his favourite read, ­Harvard Business Review, Manoj often finds himself on a plane to, or staying in India (and we mean often – about 40 percent of his time)! He finds enjoyment and satisfaction, and great scope for creativity, in applying his knowledge and experience (much of it gained in India) to grow the Westport brand and business. Presenting solutions that make business sense, he says, but also make the world better with the advantages of cleaner fuel, is rewarding work. Originally from India, his career there includes over a decade of experience at a huge multinational company where he was exposed to a lot of cross-functional activities and the pursuit of excellence in business. This, he says, “has trained me to seek what will make an impact on the business to take it to the next level,” and is highly relevant to his role at Westport. When he’s not building relationships and seeking partnerships for Westport, Manoj is at home with his family, visiting Vancouver’s iconic Stanley Park or occasionally playing tennis. Manoj claims good fortune is having a spouse who is an amazing cook of Indian cuisine, which is his favourite. He says she has great skill at creating Indian food without the typical characteristics of too much oil or spicy heat. Mexican cuisine is Manoj’s other favourite. Other than his family, his choice of dinner companion, could it be anyone alive or dead, real or fictional, is President Barack Obama. This is simply because Manoj would like to meet him in person, ask him questions and hear his insights on life, leadership and business. As mentioned, Westporters are taking turns in The Driver's Seat of our Twitter account (@WestportDotCom). To date we've heard from Nick S, Caroline S, John L & John H, Astrid Z, Lance F, Monica F, Fabio, Nicole, Ronghuan, and Maureen.